Doctors play an important role in the provision of, or withholding of, resuscitation treatment in nearly all medical situations. 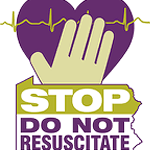 However, research suggests, somewhat disturbingly, that doctors are not well versed with the laws surrounding Do Not Resuscitate orders. ..